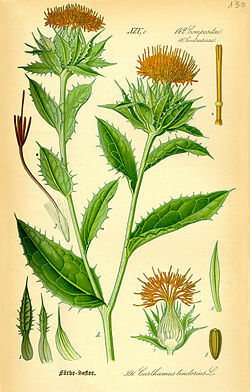 Safflower (Carthamus tinctorius) is a highly branched, herbaceous, thistle-like annual plant. It is commercially cultivated for vegetable oil extracted from the seeds and was used by the early Spanish Colonies along the Rio Grande river as a substitute for Saffron. Plants are 30 to 150 cm (12 to 59 in) tall with globular flower heads having yellow, orange, or red flowers. Each branch will usually have from one to five flower heads containing 15 to 20 seeds per head. Safflower is native to arid environments having seasonal rain. It grows a deep taproot which enables it to thrive in such environments. Safflower is one of humanity's oldest crops. Chemical analysis of ancient Egyptian textiles dated to the Twelfth Dynasty identified dyes made from safflower, and garlands made from safflowers were found in the tomb of the pharaoh Tutankhamun. John Chadwick reports that the Greek name for safflower κάρθαμος (kārthamos) occurs many times in Linear B tablets, distinguished into two kinds: a white safflower (ka-na-ko re-u-ka, 'knākos leukā'), which is measured, and red (ka-na-ko e-ru-ta-ra, 'knākos eruthrā') which is weighed. "The explanation is that there are two parts of the plant which can be used; the pale seeds and the red florets." The early Spanish Colonies along the Rio Grande River in New Mexico used Safflower as a substitute for Saffron in traditional recipes. An heirloom variety originating from Corrales, New Mexico called "Corrales Azafran" is still cultivated and used as a saffron substitute in New Mexican cuisine. In 2016, global production of safflower seeds was 948,516 tonnes, led by Russia with 30% of the total. Other significant producers were Mexico and Kazakhstan. 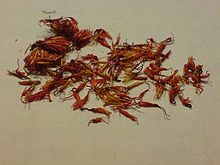 The dried safflower petals are also used as a herbal tea variety. In preliminary research where high-linoleic safflower oil replaced animal fats in the diets of people with heart disease, the group receiving safflower oil in place of animal fats had a significantly higher risk of death from all causes, including cardiovascular diseases. ^ "Tropicos". Missouri Botanical Garden, St. Louis, MO. 2016. Retrieved 16 June 2016. ^ a b "Corrales Azafrán - Native-Seeds-Search". shop.nativeseeds.org. ^ a b "NS/S Herb Seeds - Corrales Azafran". ARBICO Organics. 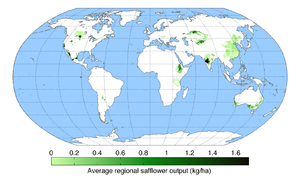 ^ "World production of safflower seeds in 2016; Browse World Regions/Crops/Production from pick lists". United Nations Food and Agriculture Organization, Statistics Division (FAOSTAT). 2017. Retrieved 4 December 2018. ^ "Carthamus red; In: Compendium of Food Additive Specifications. Addendum 5. (FAO Food and Nutrition Paper - 52 Add. 5)". FAO/WHO Expert Committee on Food Additives. 1997. Retrieved September 20, 2016. ^ Ramsden, C. E.; Zamora, D.; Leelarthaepin, B.; Majchrzak-Hong, S. F.; Faurot, K. R.; Suchindran, C. M.; Ringel, A.; Davis, J. M.; Hibbeln, J. R. (2013). "Use of dietary linoleic acid for secondary prevention of coronary heart disease and death: Evaluation of recovered data from the Sydney Diet Heart Study and updated meta-analysis". BMJ. 346: e8707. doi:10.1136/bmj.e8707. PMC 4688426. PMID 23386268. Wikimedia Commons has media related to Carthamus tinctorius. 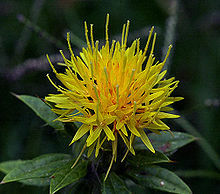 Look up safflower in Wiktionary, the free dictionary.